Showcasing a select collection of the most popular as well as lesser known works from Canadian contemporary artist Todd Lawson. For the first time ever a collection of over 70 paintings now contained in one 120-page publication. 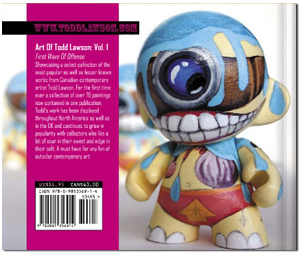 Todd’s work has been displayed throughout North America as well as in the UK and continues to grow in popularity with collectors who like a bit of sour in their sweet and edge in their soft. A must have for any fans of outsider contemporary art. Paperback edition printed on fine quality 80# matte paper and a 4-color, 10 pt. glossy cover.